The past year has been tumultuous for international politics. Citizens of the United Kingdom voted to leave the European Union (a move usually termed “Brexit”); Donald Trump became the president of the United States, despite his attacks on liberal media and unfiltered islamophobia, racism and sexism; Saudi women gained the right to drive in the past few weeks, among a few other rights; and more and more media outlets have been covering the Rohingya Muslim Genocide and its effects on the Rohingya population. Given these headlines, it’s easy to dismiss small victories by considering them trivial. Last month Fatin wrote a piece highlighting this very issue, as well as the impacts that positive representation of Muslim women in the media may have. 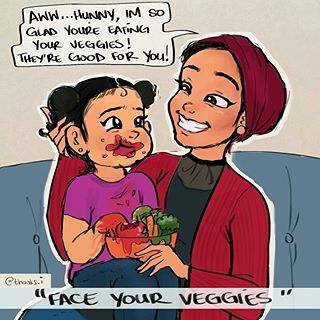 For instance, she showed how confident her nieces and cousins are in their decision to wear hijab, partly given to these positive examples, which demonstrates how essential it is for Muslim women (and racialized women, as a whole) to have representation in mainstream media and consumer markets. Being able to find your shade of foundation in the Fenty Beauty or Huda Beauty lines, for example, is part of being meaningfully represented for some Muslim women and racialized folks. These may be small victories, but they’re victories nonetheless. For me, adequate representation means being able to hear a plentiful and diverse range of stories, from a wide variety of storytellers. I prefer to have people tell their own accounts or accounts similar to their own whenever possible, as opposed to having their narrative manipulated, exploited, or outright changed by another group. This is why seeing Muslim women, hijabi women and racialized women in mainstream media, books and art can be so important for some Muslim women. Hence, I had my own personal representation victory last week, while looking at our Friday Features. I saw “Yes, I’m Hot in This,” a series of comics by Huda Fahmy. Until last week, the only Muslims I’d seen in comics were Kamala Khan (Ms. Marvel) and Sooraya Qadir (Dust from X-Men and Young X-Men). It seemed to me that Muslim women mainly existed in comics as patriarch-smashing heros. 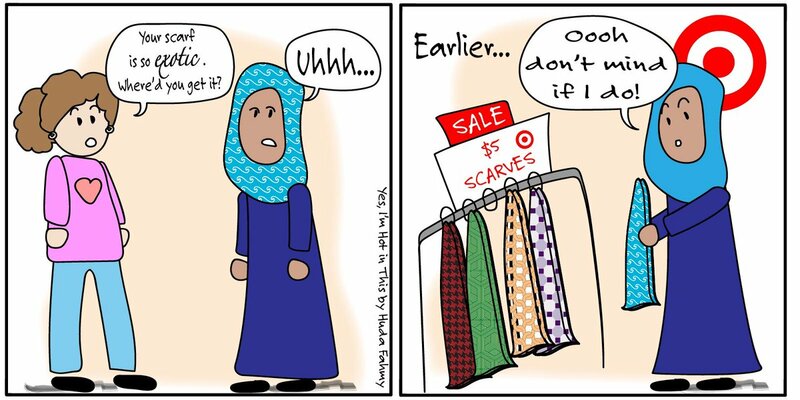 I’d assumed there weren’t any other Muslim comic strips available, which meant that Muslim women didn’t exist as ordinary people in the realm of comics. I realize this assumption may be ridiculous: I studied media in university, and a number of my friends are artists. Among them are several Muslims who also happen to draw the occasional comic, I just didn’t put two and two together. I’d been so brainwashed by the often white images of mainstream American media that I thought anything that fell out of the mainstream was on the fringe and therefore not worth exploring. After discovering Fahmy’s comics, I decided to search Instagram and fill my feed with other Muslim comic artists. I was both surprised and pleased by the diversity of comic art available. I found Nidonite, a Swiss Muslim who posts comics in both French and English, Mvzlamic, who is a British comic artist, and Thaaks.i_comics (Thaakirah Jacobs), a South African artist who maintains her comic account alongside her personal art account. All three of the artist’s main characters have different skin tones, and they all wear different styles of hijab. The comics also feature non-hijabi Muslim characters. I’m sharing all of this for three reasons. First, some of these comics, particularly the ones I shared above, may have the ability to brighten our days when news headlines are dark. The subject matter of these comics is light-hearted, and they handle heavy topics (such as Islamophobia), in my opinion, in an amusing way. Next, I’m sharing my discovery because it occurred to me that by not actively searching out diverse media and art, I have contributed to the representation gap. Yes, I put my support behind accurate, non-stereotypical depictions of racialized people on TV or in books. I’m also a Black, Muslim, non-binary, queer, assigned-female-at-birth person writing for a blog that actively seeks to analyze depictions of Islam and Muslim women in the media. Yet, before my research, I wasn’t supporting the lesser-known but deserving artists. Note here that “lesser-known” does not mean “invisible.” Thaaks.i_comics has 15.3 thousand followers; Nidonite has 34.3 thousand followers. Nonetheless, despite following plenty of other artists on Instagram, Muslim comics had slipped my attention. This, I believe, speaks to the responsibility some of us have to seek and research the options available to us, as well as the best ways to support artists who create outside of the mainstream. And finally, some of these comics, should they ever enter the mainstream, may serve to remind the world that Muslim people are, in fact, human beings . In non-Muslim countries, mainstream media outlets typically depict Muslims as “the other.” They depict us as terrorists, or as being unable to integrate. Some of the comics mentioned above handle some Muslim-specific issues like Ramadan fasting (something that many mainstream comics do with their characters when they present Christian and/or secular narratives as the “normal” and anything else as “special” or “the other”). However, they also deal with ordinary day-to-day life situations such as ordering coffee, being a mother and dealing with coworkers. These day-to-day situations may be relatable to both Muslims and non-Muslims alike, which may help bridge the perceived gap between the two groups. For those of us who have access to social media and are willing and able, following racialized people, and in this case Muslim women artists, helps advance adequate representation in media and the consumer market. Following Muslim women artists may send the message that: a) Muslims consume media just as much as the next person, b) that there is a market for adequate representation of Muslims and racialized people, and c) we’re tired of Muslim characters being based on the same old stereotypes. If for whatever reason you cannot follow Muslimah comic artists in social media, you can support diverse representations in other ways, including by amplifying Muslimah narratives and providing space for these to happen. You can also read books by and about Muslim women and discuss them with others, or you can donate to the fundraising campaigns of Muslim filmmakers, for example. And most of all, don’t forget to listen to Muslim women artist themselves about the best ways to support them according to their own goals and work! Great article! This is the main reason I started @muslimcomics on Instagram because either Muslims weren’t being represented in artwork or Muslim artisrs weren’t being recognized. Through this I have been able to find so many talented Muslim artists who spread the message through comics which many Non Muslims appreciate as they learn more about Muslims. Again, thank you for this much needed article!